Currently Lusting . 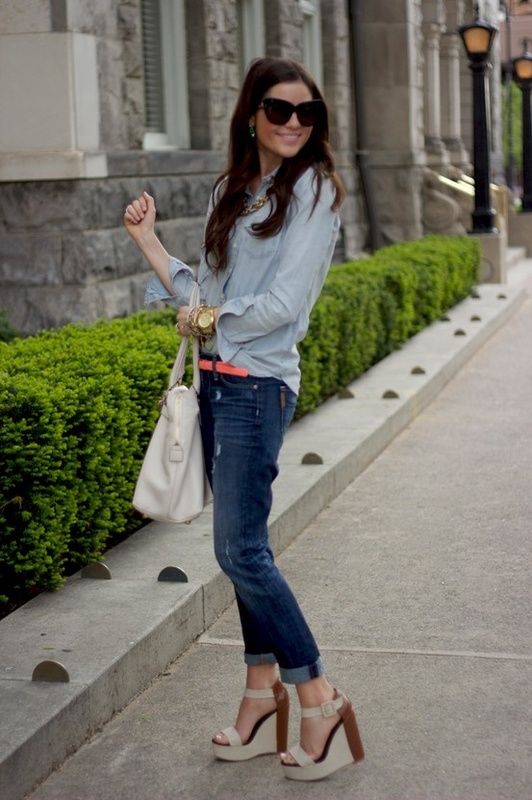 . .
﻿Boyish Chambray Shirts . . . Girl Crush . . . Miranda Kerr! F-L-A-W-L-E-S-S style. I'm also pretty sure that her Supermodel looks make it pretty easy for her to look good in just about anything. Regardless, the girl looks amazing in every single shot. Weekend Getaway . . . Happy Friday! I hope you all have an exciting 3 day weekend coming up. I'm going on a short weekend getaway with friends. I thought it would be fun to share what I'm packing. ﻿Even though I just came back to work this week after a 3 week Christmas vacation I am looking forward to the long weekend. I got my Chambray Shirt here. I had been lusting after the JCrew Downtown Field Jacket for about a year, I waited and finally purchased it during Black Friday weekend, scored 30% off, can't beat that! I have been living in it. I love love love these Sole Society studded pumps, they're a replica of the Valentino Rockstud Kitten Heels which retail $895. My Sole Society Margie Pump look-a-likes were only $49.95. I've been keeping my accesories pretty simple lately. I love my F21 Chain Link Necklace, it's such a versatile piece that's easy to pair with endless options. My Kate Spade handbag is a must for short trips, it's light yet roomy enough for all my essentials. 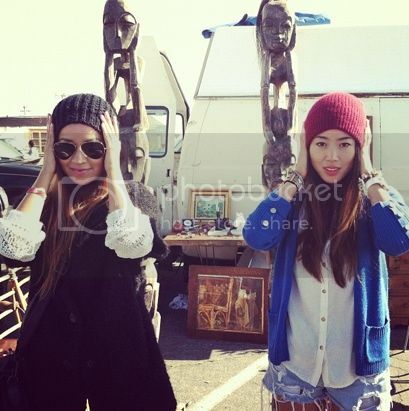 Beanie Babes . . . I totally wish I could pull off wearing a beanie but, I don't know, I just can't for some reason. Whenever I've tried in the past I feel like I look odd, maybe it's because I've always had a complex about my head being too big. 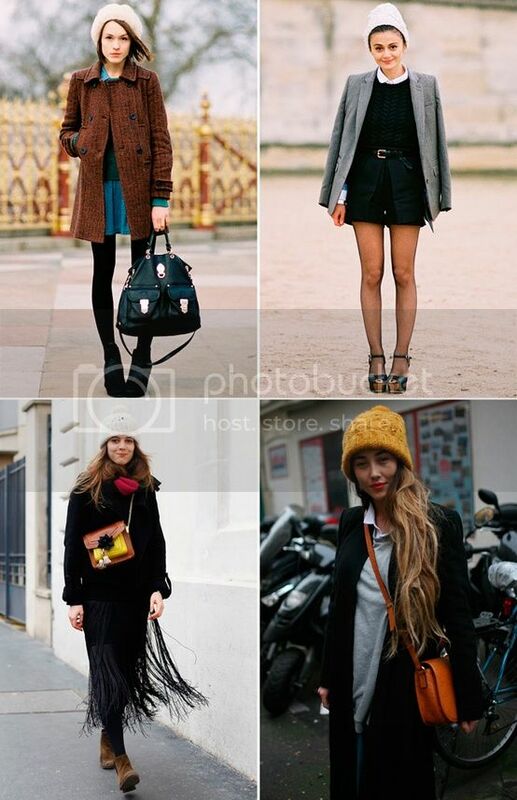 After seeing these pinterest images of stylish babes pulling off the look seamlessly I might give it another go. ﻿Hello friends! Today I wanted to share the skin care products I've been using as of late. First of all I'd like to start of by letting you know that I have normal combination skin. What does this mean? I have a slightly oily t-zone and drier cheeks with dry patchy spots here and there. I find that during the summer my skin gets a lot more oily/shiny than usual and vice versa, during the winter I MUST moisturize religiously otherwise my skin flakes like none other. As I'm approaching my late 20's I've made it a serious goal of mine to take care of my skin properly. This includes researching and investing in anti-aging products (which to be honest with you I thought were just a waste of money in my early 20's) Of course I also exercise the most common and well known practices for healthy glowimg skin which I've broken down into more detail below. 1. DRINKING WATER-I was pretty awful about this up until about 2 years ago. it's one of the healthiest changes I've ever made. 2. WASH & MOISTURIZE FACE (2x) DAILY-Even if I'm dead tired after a night out I must wash my face-no exceptions. As I've gotten older my skin has become more sensitive, any neglegance turns into a blemish or breakout. If I have a blemish or breakout I follow up my daily face wash with Clearasil's Acne Face treatment which helps clear up my skin within 1 day. During the summer I only moisturize once (in the morning) because anything more than that and I turn into a hot oily mess. Winter is the complete opposite, I have to, have to moisturize twice just to keep my skin from flaking. I alternate between my less expensive Up and Up moisturizer and the Bare Minerals brand which is a bit more expensive. Alternating between the two helps me get extended use of the Bare Minerals product, which is a plus since it is more of an investment. 3. 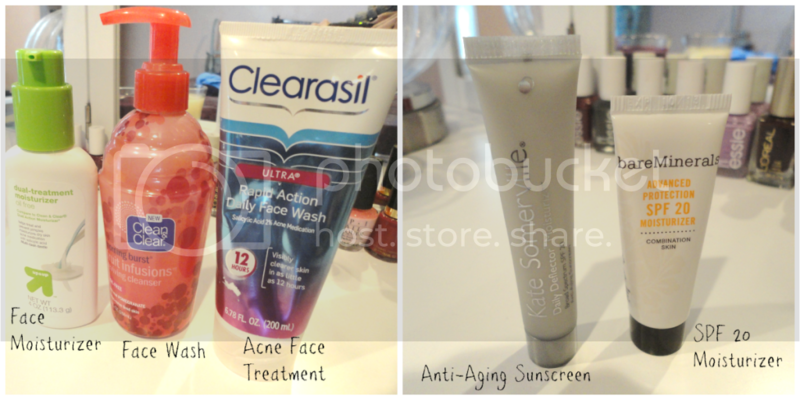 ANTI-AGING PRODUCTS-To be honest with you this is still fairly new territory for me. I've just begun to learn the basics about anti-aging products. I currently use anti-aging cream around my eyes in order to prevent wrinkles. I've recently invested more time into researching all the different types of anti-aging products in the market in order to learn which are the best to invest in. If there's any products that you recommend please let me know. I'm all ears when it comes to advice on anti-aging products. Cozy Winter Trend . . . Fun Sweaters! Happy New Year! 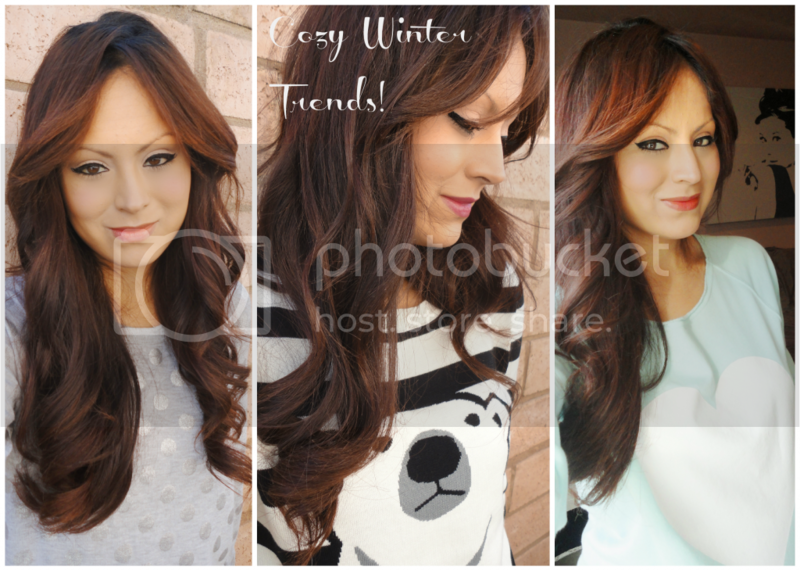 Today I want to share my favorite Winter trend, oversized graphic/print sweaters. I seriously feel like the kid in me comes out when I wear these fun youthful sweaters. Whenever I wear them out I always get stopped by girls wanting to know where I purchased them. I love pairing them with black skinny jeans/leggings and flat riding boots. It's a great way to look pulled together and be comfortable at the same time, it's perfect for those cold rainy days when you're running out the door to run errands and want to keep warm and be comfortable at the same time.